Your Majesty, it is an honour and a pleasure to express the great loyalty and gratitude felt by the Catholic community of England and Wales for the outstanding and unstinting service you give to our nation and to people throughout the world. We express these sentiments with particular warmth and admiration as you celebrate the Diamond Jubilee of your reign as our Queen. Along with Catholics across the world, and especially in the Commonwealth, we join our prayers of thanksgiving to those of other Christians for the many blessings of your reign. You also spoke graciously of the special contribution of the Catholic community to the wellbeing of our society, especially in our work with the poor, the homeless and in education. We thank you for those words and assure you today of our determination to continue to make our contribution to the common good of all, committed always to a shared search for truth in the practice of daily living, for charity in daily dealings and for compassion and justice in relation to those in need. Your Majesty, we thank you for your steadfast insistence on the great importance of our Christian faith, given in both word and example, alongside your appreciation of the contribution made by other religions in our rich and diverse society today. Our hope is that our society, enriched by the presence of many beliefs and cultures, will always maintain respect for our Christian heritage and the sure foundations it gives for a flourishing of true human fulfilment. The Gospel of Jesus, which we seek to serve, is a challenge to our society to think more deeply about the sanctity of life, the constant need for forgiveness and reconciliation, the faithfulness required in love and the self-sacrifice which brings true satisfaction. 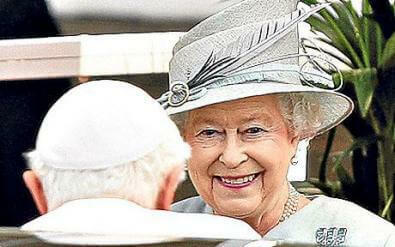 Your Majesty, it is my pleasure to assure you of our prayers for you, now and in the future and, most especially, on the day of your Diamond Jubilee when special prayers will be offered for you and your family in every Catholic Church in England and Wales. May Almighty God bless Your Majesty, preserve you in health of mind and body and grant you every grace and blessing now and for the years to come.